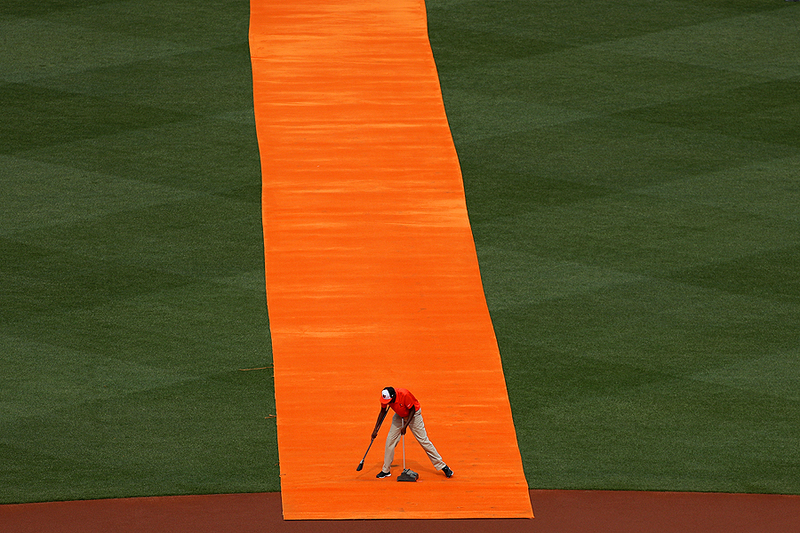 "A member of the Baltimore Orioles grounds crew cleans an orange carpet before the Baltimore Orioles are introduced before they play against the Minnesota Twins in their Opening Day game at Oriole Park at Camden Yards on March 29, 2018 in Baltimore, Maryland." Photography can often mean a lot of sitting around and waiting. Whether it's in a holding room, sitting in a photo position or even standing on a concourse - it pays to be early. The above was no different as photographers waiting for the Opening Day introductions of the Baltimore Orioles. It's easy to simply chat among the competition or relax, but I always stay focused on the scene in front of my lens as you never know would could make an interesting picture.